EARTHHOUSE – Exclusive purpose built, all–weather, rammed earth wedding/event venue. 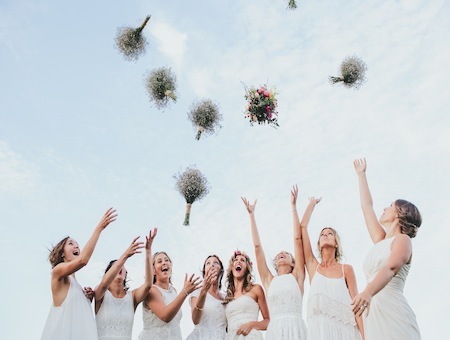 Looking for the perfect place for your Byron Bay wedding? 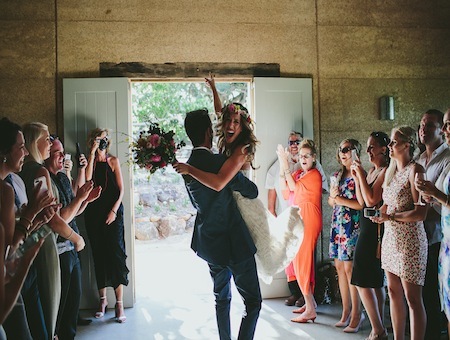 EARTHHOUSE is a unique Byron Bay hinterland venue featuring a mediterranean inspired building. Its spacious interior room offers an open fireplace, polished concrete floor and soaring cathedral ceiling with exposed timber beams. This versatile space opens onto a large verandah suspended over the Corndale Valley and overlooking the beautiful Byron Bay hinterland, with spectacular northerly views to the Nightcap Ranges. 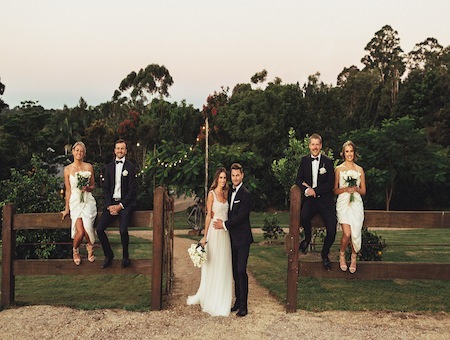 Sitting high on a ridge, the wedding and events venue nestles amongst an established garden, including a 100-year-old fig tree and complete with stonewalls. EarthHouse has been designed as a blank canvas for clients to plan and create their perfect occasion – wedding, anniversary, birthday or corporate event. For wedding/event packages and quotes please contact EarthHouse. 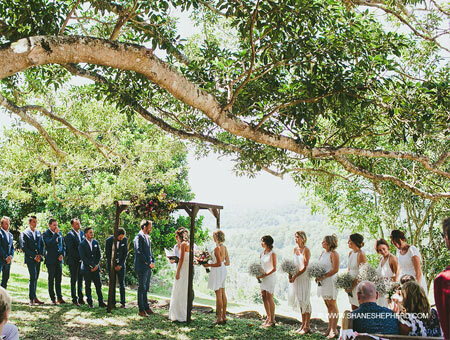 Ceremonies held beneath the fig tree. Wet weather backup depending on guest numbers is either on the under-cover verandah, or inside the reception pavilion. Large, purpose built catering area attached to venue. Choice of amazing local catering companies. (See recommended suppliers). Live and amplified music are accepted. Live music limited to a maximum 3-piece band. No percussion, live drums or brass. Designated area in main room with dance floor space. No PA equipment or sound system supplied. Music to cease by 10:00pm. 12 car parks including designated disable space. Reserved for immediate wedding party, guests staying in accommodation and on the day suppliers. All other guests are to arrive /depart via pre-booked bus. There are local bus services we recommend. The venue is not licensed. Clients must arrange all drinks. No corkage. The reception venue has 3 beautifully appointed bathrooms: male, female and disabled. 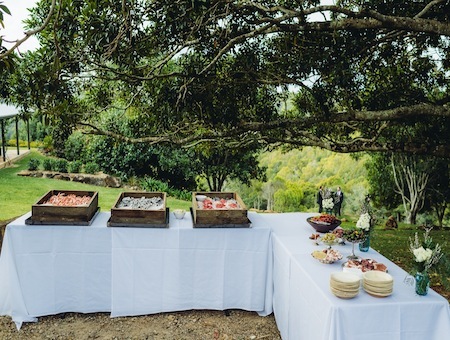 Venue hire does not include items such tables, chairs, cutlery etc. It is a blank canvas. Hire to be managed by the client. All food provided by a mobile cater of your choice. Please see recommended caterers. Caterers must be approved by EarthHouse management. EarthHouse is not responsible for rubbish removal. We recommend a local company. Only guests staying onsite at EarthHouse are permitted to use accommodation facilities. EarthHouse requires on the day coordination to ensure your special day runs smoothly. Please see recommended coordinators. Coordinators must be approved by EarthHouse management.